All venues are very warm in the winter. They are independent and offer a calm environment conducive to yoga. This is a very cute venue, my longest established class, running since 2002. Incredibly warm and cosy, built in the 1920’s for the purpose of adult education, it is still going strong today. It is very modern inside, with a sealed floor and new central heating which sees us in light clothes on a winter evening. The Adult School is located on the corner with Nene Road and there is plenty of street parking in the immediate vicinity. 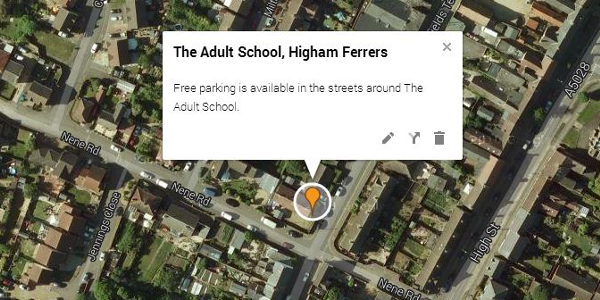 Map of The Adult School, Higham Ferrers. Click the map for a better view in Google Maps. The Studio in Rushden – a beautiful space, it offers carpeted underfloor heating. This is the perfect venue with soft lighting and surround sound. Everyone loves this space. It was originally a typical Northants shoe factory and has now been converted into a beautiful space. There is plenty of car parking available in the Duck Street car park, only a couple of minutes’ walk away. This venue is set back off the road, nearer to the bottom of the hill of Fitzwilliam Street. Between the terrace houses of 21 & 25, you will see a drive, taking you toward the old shoe factory. Go through the black Iron Gate to the BIG BLUE DOOR – the door will be open. 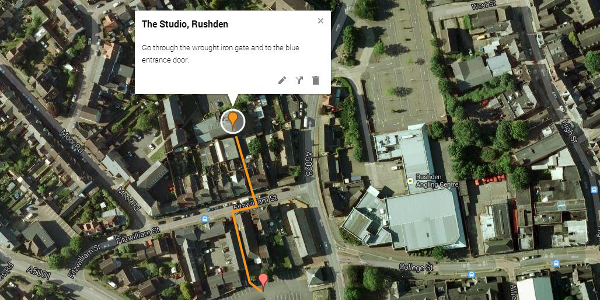 Map of The Studio, Rushden. Click the map for a better view in Google Maps. The Masonic Hall is a delightful venue, quite and light. If you are lucky, we sometimes use the amazing (Harry Potter eat your heart out!) Lodge Room – OOOOooooOOOO. Again, great heating is available when needed. This venue is located at the bottom of St Margaret’s Avenue, on the corner with Wellingborough Road. There is plenty of off-road parking available directly at this venue, just drive in. Drive through the gate and park within the gates of the venue. There are plenty of parking spaces in front of, on the side and at the back of the Hall. Parking outside the gates might result in you receiving a parking ticket. 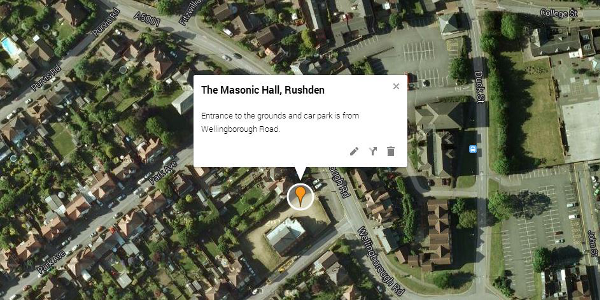 Map of The Masonic Hall, Rushden. Click the map for a better view in Google Maps.